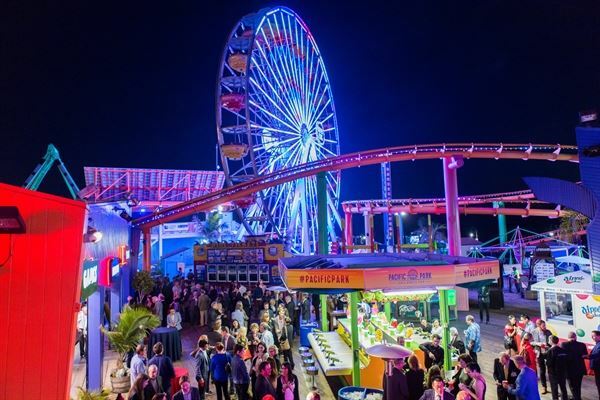 Enjoy a fun filled, over-the-ocean private event with unlimited rides, midway games with cool prizes and delicious food all mixed with sun, ocean breezes and spectacular views on the historic Santa Monica Pier. Pacific Park® is the perfect iconic location for corporate events, company picnics, wrap parties, movie premiers, sales incentives and more! Pacific Park’s Event Pavilion offers spectacular views of Malibu cliffs, the Pacific Ocean and Catalina Island, and can host groups from 50 to 350 guests. An exclusive Park buy out can accommodate up to 2,000 guests. Custom event packages and catering are available including specialty menus, traditional theme park fare and bar packages all topped off by an experienced culinary team and a beautiful ocean setting. Pacific Park is a 2 acre amusement park with amusement rides, midway games with prizes, oceanfront food plaza and retail shopping. The Park can be reserved exclusively to accommodate up to 2,000 guests. Special Features: Built in entertainment with 12 exciting amusement rides, 22 challenging midway games with cool prizes and an over the ocean food plaza. Our Seaside Event Pavilion is a private, tented area in the amusement park that offers spectacular views of the Malibu cliffs, Pacific Ocean, Catalina Island and the Santa Monica coastline. It can accommodate groups of 50 up to 350 guests. Call us today to host your next company picnic, corporate meeting or special event in our Pavilion! Come enjoy the rides, midway games, delicious BBQ, funnel cakes, ice cream and best of all, sea breezes and sunshine!